The Geminid meteor shower is always reliable, but might be extra special in 2017. Peak morning is likely December 14. Be sure to watch for the moon near the morning planets. The Geminid meteor shower – always a highlight of the meteor year – will peak in 2017 around the mornings of December 13 and 14. Geminid meteors tend to be few and far between at early evening, but intensify in number as evening deepens into late night. Observing around 2 a.m. is best. This shower favors Earth’s Northern Hemisphere, but it’s visible from the Southern Hemisphere, too. 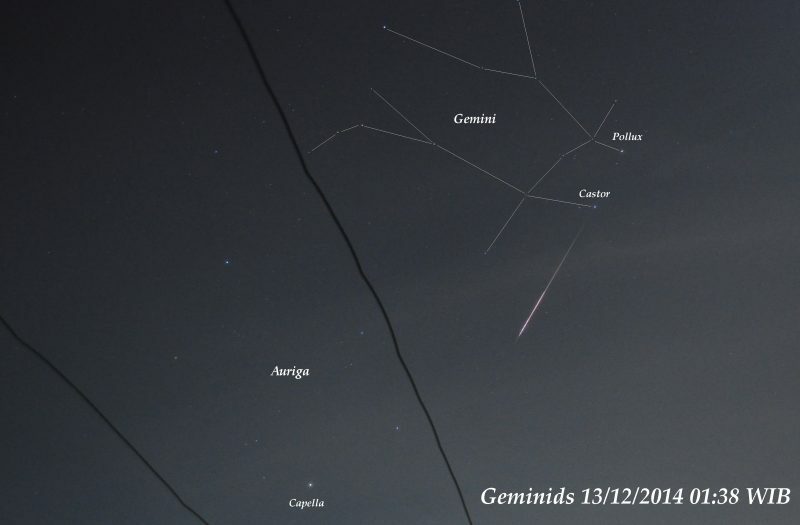 The Geminids’ parent body – a curious rock comet called 3200 Phaethon – is exceedingly nearby this year, due to make a close sweep past Earth on December 16. Follow the links below to learn more about the Geminid meteor shower in 2017. How to watch the Geminid meteors in 2017. You can indeed watch this shower in the evening (late evening is best). But the greatest number of meteors will fall in the wee hours after midnight, centered around 2 a.m. local time (the time on your clock no matter where you are on Earth), when the radiant point is highest in the sky. As a general rule, the higher the constellation Gemini climbs into your sky, the more Geminid meteors you’re likely to see. 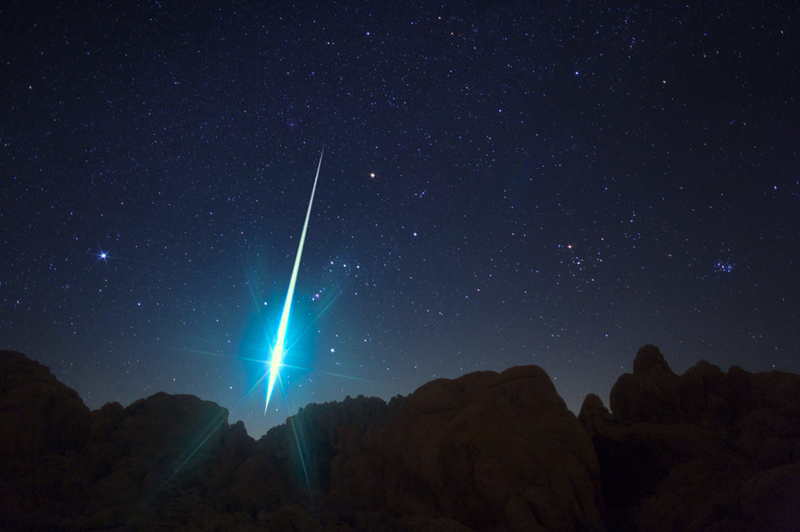 These meteors are often bold, white and bright. On a dark night, you can often catch 50 or more meteors per hour. You need no special equipment – just a dark, open sky and maybe a sleeping bag to keep warm. Plan to sprawl back in a hammock, lawn chair, pile of hay or blanket on the ground. Lie down in comfort, and look upward. By the way, you don’t need to find a meteor shower’s radiant point to see the shower. The meteors will appear in all parts of the sky. It’s even possible to have your back to the constellation Gemini and see a Geminid meteor fly by. 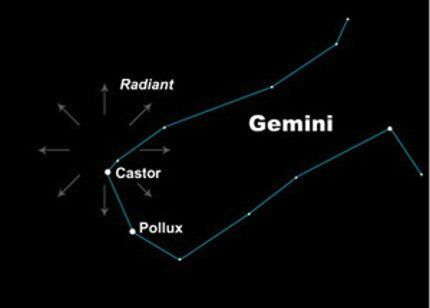 However, if you trace the path of a Geminid meteor backwards, it appears to originate from within the constellation Gemini. When you’re meteor-watching, it’s fun to bring along a buddy. Then two of you can watch in different directions. When someone sees one, they can call out “meteor!” This technique will let you see more meteors than one person watching alone will see. Be sure to give yourself at least an hour of observing time. It takes about 20 minutes for your eyes to adapt to the dark. Be aware that meteors often come in spurts, interspersed with lulls. Geminid’s parent – 3200 Phaethon – is nearby in 2017 Every year, in December, our planet Earth crosses the orbital path of an object called 3200 Phaethon, a mysterious body that is sometimes referred to as a rock comet. The debris shed by 3200 Phaethon crashes into Earth’s upper atmosphere at some 80,000 miles (130,000 km) per hour, to vaporize as colorful Geminid meteors. In periods of 1.43 years, this small 5-kilometer (3-mile) wide asteroid-type object swings extremely close to the sun (to within one-third of Mercury’s distance), at which juncture intense thermal fracturing causes it to shed yet more rubble into its orbital stream. 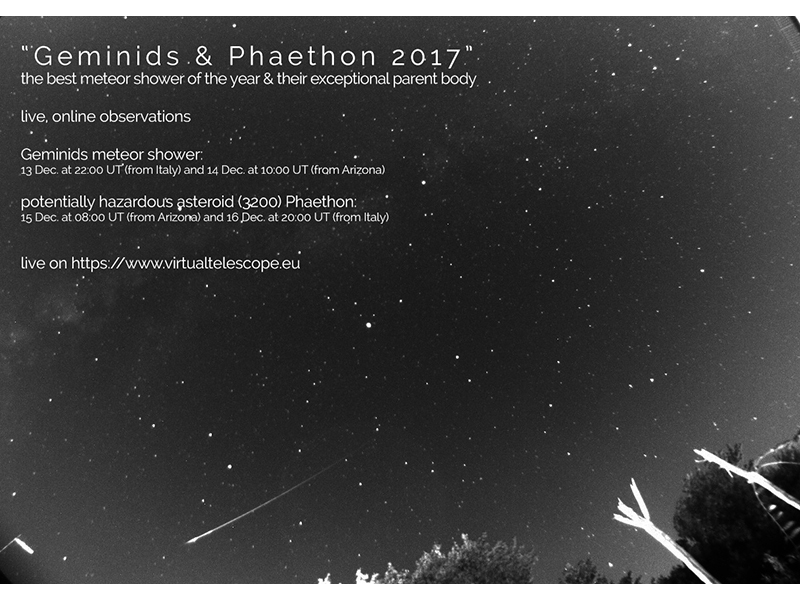 In 2017, 3200 Phaethon will be exceedingly nearby around nights of the Geminid meteor shower’s peak. This object will sweep close to Earth – just 0.069 astronomical units (6.4 million miles, 10.3 million km, 26 lunar-distances) on December 16, 2017 at 23 UTC; translate to your time zone. The proximity of this object might mean a fantastic year for the Geminids in 2017. Observing before dawn? Watch moon sweep past planets. One of the best things about this year’s Geminid shower is that the moon is out of the way. It’s a waning crescent in the east before sunup and so shouldn’t interfere much, if at all, with your meteor-watching. Plus, the waning crescent moon will slide past the morning planets, on the peak mornings on the 2017 Geminid shower. Look at the chart above. See how the moon gets closer to the sunrise point each day? That motion of the moon across our sky is a translation of its motion in orbit around Earth. Bring along your binoculars when watching for the moon and planets, on the nights of the Geminids’ peak. They won’t help you watch meteors, but you’ll be able to see Jupiter in the same binocular field of view with the star Zubenelgenubi in the constellation Libra the Scales. 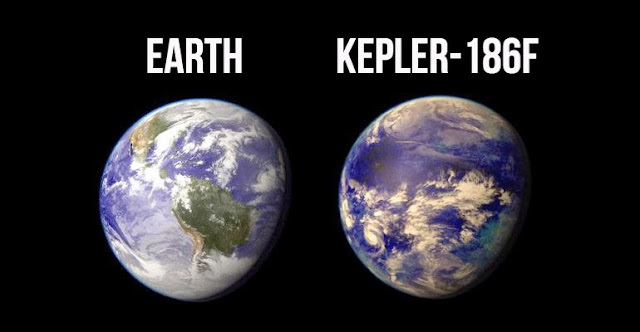 Look closely, and you’ll see that Zubenelgenubi is a double star – two stars in one! An earthgrazer meteor possible at early evening. You won’t see as many Geminid meteors when the constellation Gemini sits close to the eastern horizon during the evening hours. But the evening hours are the best time to try to catch an earthgrazer meteor. An earthgrazer is a slow-moving, long-lasting meteor that travels horizontally across the sky. Earthgrazers are rarely seen but prove to be especially memorable, if you should be lucky enough to catch one. Why are these meteors called the Geminids? If you trace the paths of the Geminid meteors backward, they all seem to radiate from the constellation Gemini the Twins. This shower’s radiant point nearly coincides with the bright star Castor in Gemini. 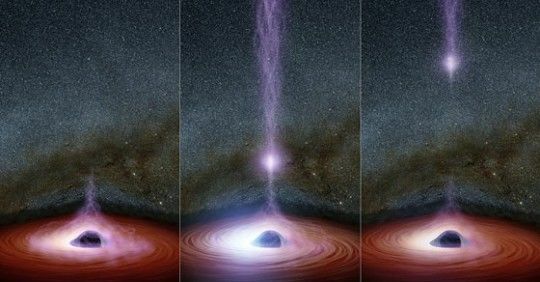 That’s a chance alignment, of course, as Castor lies about 52 light-years away while these meteors burn up in the upper atmosphere, some 60 miles (100 km) above Earth’s surface. Again, you don’t need to find the constellation Gemini to watch the Geminid meteor shower. These medium-speed meteors streak the nighttime in many different directions and in front of numerous age-old constellations. Bottom line: Meteor showers are part of nature and so inherently unpredictable. But the 2017 Geminids might be an awesome shower! Peak mornings December 13 and 14. Moon near morning planets. 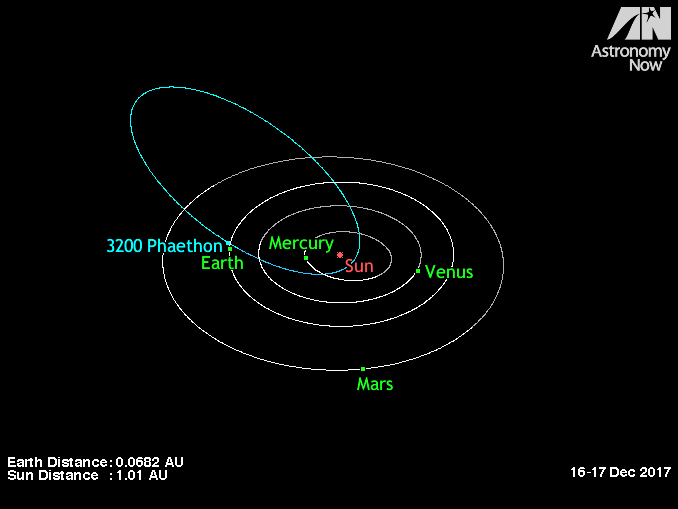 Parent body – 3200 Phaethon – nearby.